Throughout this year to commemorate the fallen of the 1914-18 war the Urban Arts Centre, DJ School, Verbal Arts and Quhwah Publications will be collaborating on a ground breaking project. The local organisations have come together with funds from the Heritage Lottery and local businesses to bring their unique and specific expertise to this very import project. Remembrance Poets is the brain child of Gary Oliver internationally renowned local poet who found fame with his Books Woodun Indians, Dear Love Powa and Contemporary Common Criminal. Gary has worked closely with Jonathan Dale of the Western Front Society and artists attending the Urban Arts Centre in Castlefield Street, Etruria to develop this nationally import project. resonance locally and chart the influence of the conflict on the local area. We seek to bring them to the fore with this project. Jonathan Dale from the Western Front Society Midlands division said ‘it is very important that we keep the knowledge of this conflict and the memories of the fallen alive so that future generations can learn from the mistakes of the past. To be considered for one of the twelve commissions send an example of work with contact details attached to the Urban Arts Centre and the staff at the Centre will contact you if you are successful. Those successful in winning the commission will be mentored by professional poets and researchers with research skills, performance skills and to develop their poetic writing skills. 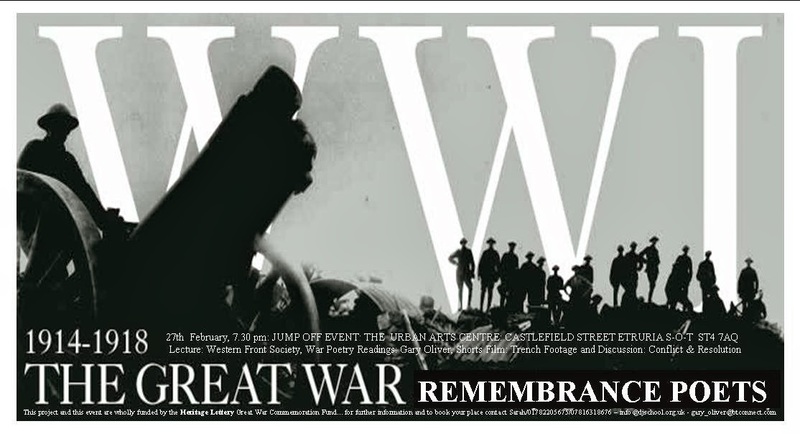 Also, there will be a number of public events starting with a jump off event on the 27th February, where Jonathan Dale from the Western Front Society will give a talk on the Great War and the Midlands. The event will show a film about life in the trenches with actual footage of trench life and Gary Oliver will read Wilfred Owen the celebrated war poet’s work. Afterwards there will be a discussion about conflict and resolution 1914-2014. The twelve successful poets will also get a free day trip out to the Imperial War Museum and to The National Arboretum. Upon completion of the commission the successful poets will be celebrated in a presentation ceremony and awarded a commemorative copy of the audio book. If you are interested in attending any of the events please reserve a place on the contacts above as soon as possible as there are limited places available. All our staff are educated to a high standard and fully CRB checked and insured you can received all numbers upon request. We had a successful year in 2013 working with over 3,000 people through interactive arts intervention in direct workshops, events in the Staffordshire area. We have a new fully committed board of trustees who are pushing on into 2014 with great gusto to bring interactive social arts to people from all walks of life who will benefit from the intervention. As you can see we have a comprehensive project package taking us into the New Year alongside our Event Kids Karnival which will be on 27th July 2014 at Etruria Park this year with an emphasis on themes surrounding happiness, healthiness and staying safe, Kids karnival will feature alongside other events planned in the city over the next 12 months. The DJ school Association are looking to work with schools, youth groups, community group’s mental health facilities and higher education facilities. The At the Start project bridges and fosters themes of positive thing, health lives and safety and community cohesion and intervention based social arts to develop and nurture new skills and to encourage a positive outlook on lives moving forward. Partners will be at the forefront for targeted planning for their cohort. Anyone interested in becoming a partner on this exciting new project please contact Sarah at info@djschool.org.uk. Saturday 22nd February 2014 11.30am till 3pm celebrating 7 years at the Urban arts centre with an eclectic mix arts and performances. New learners will be able to enrol on new programmes on the day.